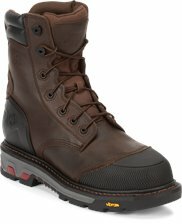 The Drywall Pullon Waterproof Steel Toe is a 10-inch tall Men's pull-on work boot with a distressed beige waterproof leather exterior. The steel toe provides armor-like protection and it's built for comfort with the J-Flex Flexible Comfort System® that guarantees lasting support throughout the day. The rubber outsole offers traction on various surfaces and is an ASTM electrical hazard rated boot that provides protection from open electrical currents up to 18,000 volts. 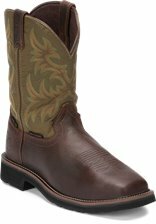 Boots are great, fit well and made for working feet! These boots do not fit the same as other Justin workboots- they are quite a bit smaller. I have recently purchased my third pair over a five year span. First pair is still going when I'm on jobsites, and my second pair are for my day to day wear when I'm in areas that don't like my muddy boots. Bought my third pair to make sure I have these going forward because they are that comfortable daily. I have the non steeled toe version of these for weekends. Both styles look great and go with most items I wear. You can't get any better and I hope Justin continues to offer these great, good looking boots for years to come. Bought boots 9 months ago not broke but want another pair in the bullpen Best boot I've worn 37 yrs millworking. We've got over 135 years of experience crafting boots to keep the toughest workers safe and comfortable on the most hazardous jobsites. All you have to worry about is getting the right fit and knowing how to take care of your boots. This video covers the three-step fit process for pull-on boots, along with leather care tips and products. 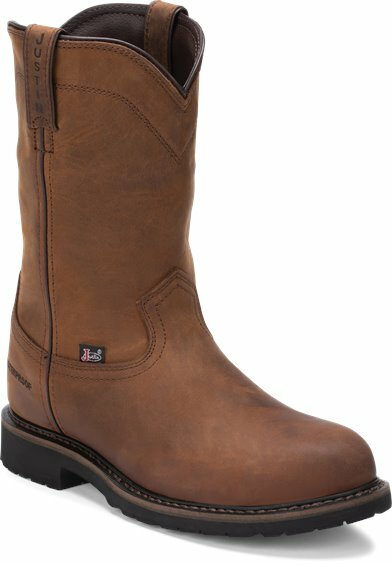 The patented J-Flex® Flexible Comfort System® helps make Justin Boots the most comfortable boots you'll ever own. You won't believe your feet when you feel the energy return generated by the leather-covered cushioned insole and triple density insole board. It will feel like we broke them in for you. J-Flex Flexible Comfort System technology components vary by product category. For those working in environments where the chance of exposure to electrical currents is high, electrical hazard boots are the way to go. 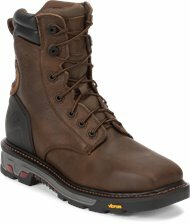 Our ASTM Electrical Hazard Rated boots provide protection from open electrical currents up to 18,000 volts. When it comes to foot protection, nothing beats the effectiveness of steel toe boots. Whether you're working on a ranch, a construction site, or hundreds of other places, there are always risks of falling objects. 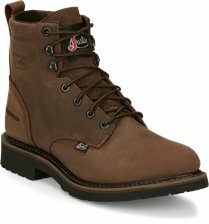 Steel toe boots from Justin are the ideal solution for the working man and woman. Waterproof boots are pretty much a necessity when your job calls for working outside in the rain, mud and muck. Our waterproof leathers make sure your feet stay dry no matter what the conditions.